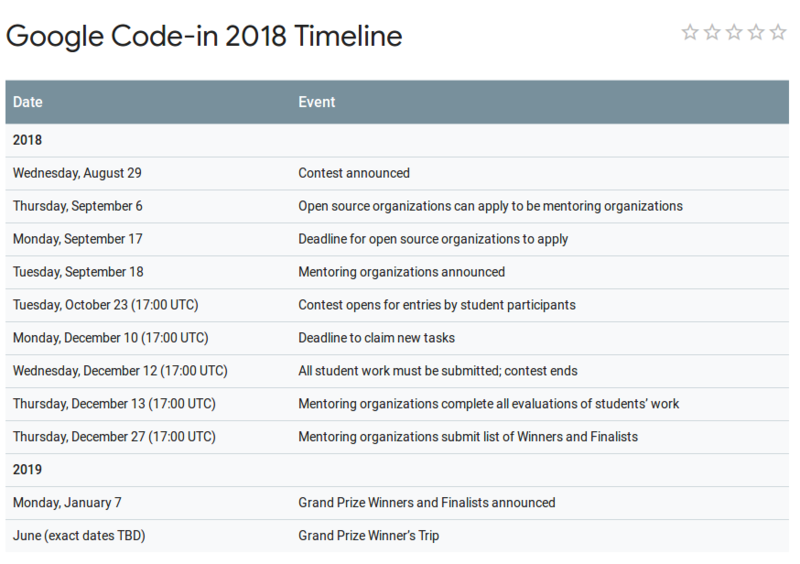 Google Code-In 2018 has been announced! If you’re not aware of Code-In then I’d recommend reading the ‘about’ page on their site. tl;dr. It’s an opportunity to mentor young (13-17 years) students in contributing to your open source projects. Last year we took part as “Ubuntu” in which we had a bunch of traditionally Ubuntu distro related tasks mixed in with a bunch of snap/snapcraft related ones. After some seriousl thought this year we’re going to change things. We - the Snap Advocacy Team (myself and @Wimpress) are considering a snap/snapcraft entry for this year. We will not be including any “Ubuntu” tasks. That’s where you all come in, and why I’m mentioning it here. Does anyone else (both Canonical and the wider community) fancy preparing an Ubuntu submission? If so, you have until September 17th to prepare the submission. Martin and I would be happy to provide guidance and support. We won’t be admins of the application, but could be convinced to mentor some appropriate tasks if needed :). It’s a lot of work to prepare for, and you need to be able to come up with a substantial and diverse set of tasks across various categories for the students to complete. It’s a great opportunity to mentor new students. Would we both use the #ubuntu-google channel or would that one be for Ubuntu and the Snappers would create a new one? Outside of the logistics, I would certainly be interested in playing admin and mentoring. Almost. Yes, I’m suggesting two orgs. One for Snap/Snapcraft and one for Ubuntu. I don’t actually know if we will submit one for Snap/Snapcraft, we need to figure that out, which we will do over this week/next week. Dunno if we have time and enough tasks to make it worthwhile. To clarify, for the Ubuntu org submission, I’d envisage at least someone from Canonical (who are part of the community ) being involved in some way, not least because there’s a lot of Canonical people who contribute to Ubuntu :). Whether that’s required or not, I’m not sure. If accepted, we’d have to think carefully about where discussion goes, but I would completely separate the groups. No common mailing lists, forums, irc channels at all. So it’s totally clear they’re separate orgs with different tasks, goals etc. There may be some overlap of people who are mentors / admins, but they’re two roles. Ok, well, I’m more than willing to lead the charge for the community side. Just let me know what you need me to do. Got the official email announcement that it’s now open for registration. I’m anxious to get going, especially given the deadline. What’s the next step? BTW they say they plan on taking 28 organizations this year. I’d like to add: (and @tsimonq2 can vouch for this) Lubuntu has A LOT of fresh ideas coming in with the advent of LXQt. I mean, 18.10 is going to be a lot of changes but we have a lot more planned. So we’d really love to take advantage of GCI. Absolutely. I was a mentor for 2015 and 2017, is there a spot open for an admin? Watching this topic with interest to see where it goes. I’ll echo popey in that being a gci admin is a good bit of work, but you’ll get a chance to meet and work with some amazing students. I’d love to be involved as a mentor if an application is created and accepted, but I’m afraid I can’t commit to more than that. I think it makes sense for the community council to manage the Ubuntu application, for sure. Are there sufficient people to prepare the application and create the tasks? It’s due on Monday. I think it’s generally a good idea to have someone from Canonical on the application, but I don’t think the Canonical name has to be on it. I think it’s daft to assert that just because Canonical people are involved the name on the application has to be changed. Yes, there are financial components to this, so someone at Canonical will be involved at some point because it’s the Canonical bank account these things get paid into (and come out of). Back to the point. Who will run this as admin, and who will mentors be? Who’s running this? Who will run this as admin, and who will mentors be? Who’s running this? I can admin. We need one other one. to get in the door, so you got someone from Canonical @popey or does anyone else want to step up? which I can do but I obviously can’t complete this until we have another mentor as naming that is actually part of the whole application (right?). Once we have the app in, then we can work on actually collecting more mentors and getting tasks drummed up. That should be fairly easy. I think I can handle that! I’ll be the second name if you need it. @UniversalSuperBox consider it done! Let’s get started on the application! @popey one of the requirements for orgs is a blog post, so how is that going to work? Just stick something on the Fridge or via Planet Ubuntu or… ? I’d rather let someone else do that. If I’m also doing snapcraft admin, I just won’t have time to do it justice, and that wouldn’t be fair on the participants. We found creating the 25 tasks was one of the larger things to do. It took myself and @Wimpress most of this morning to get the application done, including the wording for the application and all the tasks. Hah! If we’re not accepted as snapcraft I’d be happy to use some spare time to help with the Ubuntu org if needed. Here’s the tasks we did for last year’s Ubuntu application, in case that’s useful. Here’s the tasks we wrote for this year’s snapcraft application. I didn’t mean you, I meant someone else from Canonical. One other thing: regarding the Grand Prize trip, a legal tax entity is required for them to send money for stipends. I presume this would all go through Canonical like normal? Yup, we can put you in touch with the people with the right access here. We’re coordinating in #ubuntu-google and have a pad going to enumerate our 25 tasks, etc., if anyone wants to join.